Next weekend is Easter and of course in the days before everything revolves around this holiday. Especially with my daughter the joy rises. I have created a suitable layout. And what fits better than a nest full of Easter eggs! Except in this case it’s a garland of eggs. For this I used different tools, so every egg looks different. I like to add different effects to a layout. First I used the Big Happy Jig and made an egg out of wire. I created a small template for myself and then put the pegs on the board. For the next egg I used the Fuse Tool and many colorful sequins. After a long time one of my favourite tools was used again! First I sketched a template on paper. Then I glued it on an old project life page protector and cut it generously with scissors. Then I put the sequins between the two plastic sheets and closed the egg with the Fuse Tool. I made another egg with the help of a hand sketch. The Stitch Happy Tool was also used again. I first sketched two eggs with a pencil. The points for the embroidery holes were made. Then I removed the lines again with an eraser. And now embroidered. Finally the title was created with the Word Punch Board and the papers of Heidi Swapp. Thank you very much for stopping by and I wish you a nice Easter! Hello everyone! It’s Eva on the blog today showing you how to create a layout using the new Foil Quill. The Foil Quill is truly a game changer and I love that I can use it for a variety of projects, including scrapbook layouts. The Foil Quill has 3 tips: The fine one is perfect for journaling, the medium for fine lines in general and the thick tip for filling in shapes. Because the tip is like a sketch pen if you want to fill your shapes you will need to work that on your die cutting machine software first. Here I am using Silhouette Studio and wrote a word with a brush script font. Using the Emboss tool (marked with a red circle), fill the shape with concentric lines (marked with the blue circle). You can adjust the spacing of the lines, I used a 0.5 mm spacing for the thick tip of the Foil Quill. Before sending your project make sure you hit the button “release emboss” otherwise you will not be able to send your design. For the journaling I used my fine Foil Quill tip and a sketch font called “Golden Rule Sketch” I highly recommend you use sketch fonts with small journaling otherwise your letters are going to turn out bulky. When I had everything ready I used the tape to hold my foil to the paper and hit send. My journaling turned out great! The foil looks amazing and you can read it perfectly. I added a few numbers and embellished the bottom part of my layout. On the bottom, I added a picture and also included the “First week” phrase that I had previously foiled and cut with my Cameo. I didn’t wanted to foil it directly on the paper so I could use some 3d dots and add a few die cuts underneath. Finally, I foiled a few stars on vellum and added them to my layout. I wanted my stars fully foiled but I didn’t adjust the spacing right, that’s why you can see the lines. I was going to do them again but thought they were pretty that way and left them! A few more starts on the top part of the layout and I was done! I love how my layout turned out! The silver foil looks perfect on blue cardstock and it is amazing the detail you can get with the fine tip. Do you have a Foil Quill? If not you should get one! You can use it for so many things and even the simplest card looks great with foil! Thanks for joining me and have a great day! Hello, We R friends. Enza here, and I’m so excited to share with you my very first scrapbook layout using the amazing Foil Quill. This product is absolutely mind-blowing! You can create beautiful foil projects in minutes, with just your electronic die-cutting machine and one of the tip pens. So easy! And the results are oh so good! I started with a gorgeous floral design by Kelly Creates. There is a wide selection of designs from some of the most popular American Crafts collections to choose from. I wanted to create my own background and this design worked perfectly for it. After inserting the right adapter where the blade would go in my die-cutting machine, I opened the design, enlarged it to the desired size, and sent to cut, making sure to select the Sketch Pen option. It is very important that the foil is secured and wrinkle-free – I used the special Placement Tape to keep it in place. I couldn’t believe how detailed and precise the design came out! I love the big size and the shiny look – it adds so much interest without being overwhelming. Once the background was ready, I started working on my photo. I arranged a layered flower cut file in the center of the layout, adhering each layer with foam adhesive for dimension. In order to fit the photo inside the flower, I cut it with a circular decorative die. I love adding foliage and other embellishments around my photos. Here I combined bits and pieces from the lovely Horizon collection by Pink Paislee with die-cut leaves and branches. To finish the layout, I simply formed two clusters in opposite corners of the page, mixing chipboard and puffy stickers with die-cuts and fussy cut elements. The Foil Quill system is a must-have. I hope I have inspired you to give it a try and create beautifuk, shiny projects with it. Hello everyone! 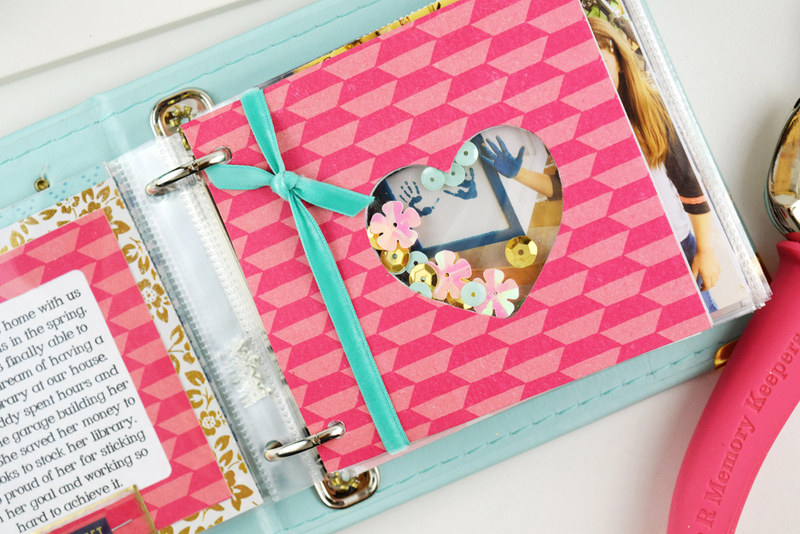 It’s Eva here showing you how to use the Washi Tape Runner and the Pocket Punch Board to create an easy mini album. The new Washi Tape Runner is the perfect tool for all your washi tapes; you can use different roll widths and the tool has also a retractable blade for easy cutting. I decided to use my washi tape to bind my mini album, adding texture and color to my project. 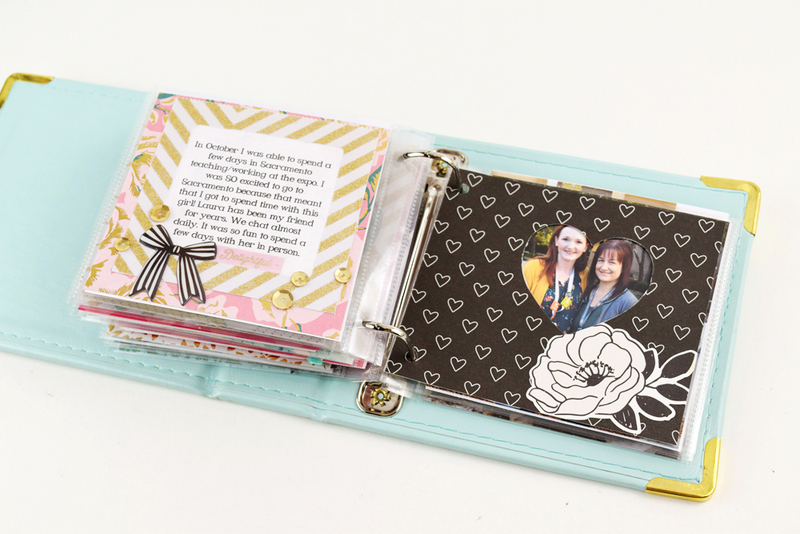 The first thing I did was using my Pocket Punch Board to create the pages of my album. This tool is super easy to use and you can create pockets with or without flaps. It even has a notch punch on top with guides so you can center your notch every time! Next, I used my Washi tape runner and some lovely washi tapes from the Succulent set to bind my pages. 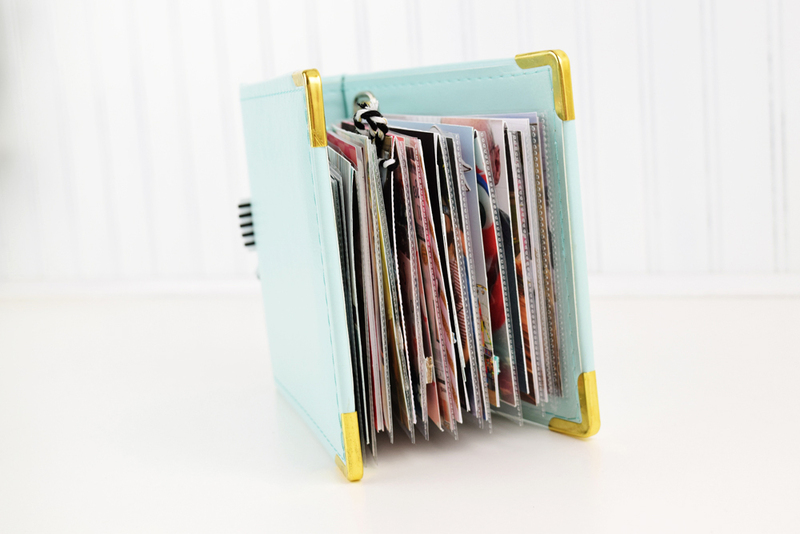 I bind all of my pages first and then run my mini album through my Stitch Happy to secure the pages. Inside the mini album I used washi tape in different ways, for example: I used it to hold my pictures, the thin washi tape is perfect for that because it doesn’t distract you from the picture. Inside the pockets you can add pictures, tags, journaling or memorabilia! I also used my washi tape to create a flap with my photo. You can lift the photograph and read the journaling underneath. This is a great way to add more pictures too! You can also use your washi tape to embellish; the designs are super cute and they are perfect for everyday projects, besides the Washi Tape Roller leaves a beautiful cut and it is easy to cut your washi exactly were you want. Finally, I used my washi tape to add a big picture to my mini album. I simply cut it in two and held the two pieces together with some washi tape. The last page is very simply and I only used the washi tape to hold that cute picture of my little boy and me. Washi tape is so versatile and I am sure you have tons in a basket waiting to be used! I am sure that with the new Washi Tape Runner you are going to be using it so much more! Hello and Welcome to a new layout with a new tool. This time with the Ribbon Stitch Tool. With this tool you can quickly and easily create great woven effects. For this you need the colorful ribbons from We R Memory Keepers. First, I thought about how I could best use the tool on my layout. And so I decided to use circles. The layout has the size 9 x 12 inch. First I cut out 3 circles with the cutting machine. A circle for the ribbons. The holes for the ribbon are made with the small handy piercer. The magnetic guide is placed on the cardstock and there you go. The paper does not slip through the magnets. I pierced the holes in a staggered fashion. To create a woven pattern. Many colorful ribbons are available from We R Memory Keepers. And I really wanted to put a lot of colors on my layout. Due to the different materials and patterns the ribbons look very interesting. The ribbon is attached to a small adhesive needle. I used the needle for all the tapes. That worked great. You don’t always have to use a new needle. After embroidering, I wrapped some yarn around the edge of the circle and glued them to the back. I decorated the lower circle with papers from the Crate Paper collection La La Love. I hope you enjoyed my short tutorial and thank you for stopping by. Hello and Happy Friday We R fans! Our Precision Press Accessories are hitting stores and we couldn’t be more excited! These accessories together with the Precision Press Advanced open up so many amazing creative possibilities. Check out this beautiful project idea by Laura Silva! Try making your own patterned paper with the Precision Press Advanced and Precision Stencils! Place the stencils over your watercolor paper and paint away. You’ll get a lovely soft water color pattern on your paper! 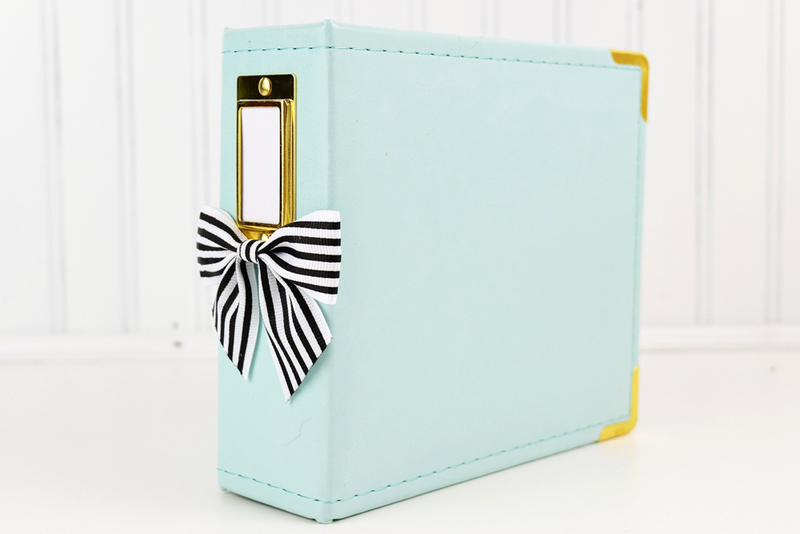 Then take the dried paper to your 123 Punch Board to make a favor box for your next event. Use the Typeset Stamping Block to personalize your gift tags, invitations, announcements and cards. It’s perfect for bulk projects like save the date or holiday cards! Be sure to check out the new Precision Press Advanced Accessories in stores now, and get stamping! Have a great weekend friends. Hello and welcome. It’s me, Steffi and I’m showing you a layout of me today. This I have created with the great Precision Press Advanced and the Pattern Block & Stamps. A tool to stamp precise and exact images every time. The acrylic plate has grooves. In it the letters can be placed exactly and do not slip. I think that’s great. One can stamp several times and the stamp does not slip. That doesn’t work so well with a normal acrylic block. I also think it’s great that so many letters are present several times in the alphabet. So you can stamp several words and texts at the same time. I think that’s great. It makes it a lot easier. First I painted the white cardstock (9×12 inch) with acrylic paint. After the paint had dried, I stamped on it. I used the Precision Press Advanced with the Pattern Block & Stamps. The patterned motifs are great for beautiful backgrounds. I used the feathers. I stamped directly on the cardstock and a few feathers on vellum paper. I cut them out and glued them to the layout with glue dots. So it gets more dimension. Then I stamped the title with a black ink stamp pad. Below the photo I used some more patterns from the Pattern Block & Stamps. The stamps are very versatile. Then I added the photo with stickers and paper from the Crate Paper La La Love collection. Thank you very much for stopping by and see you next time. Hello everyone! 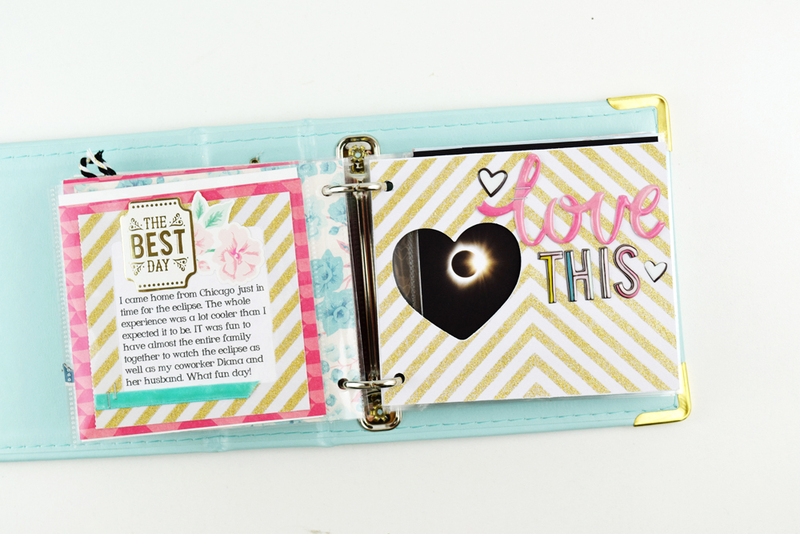 It’s Eva Pizarro on the blog today sharing a layout using some tools from our Journal Studio line. 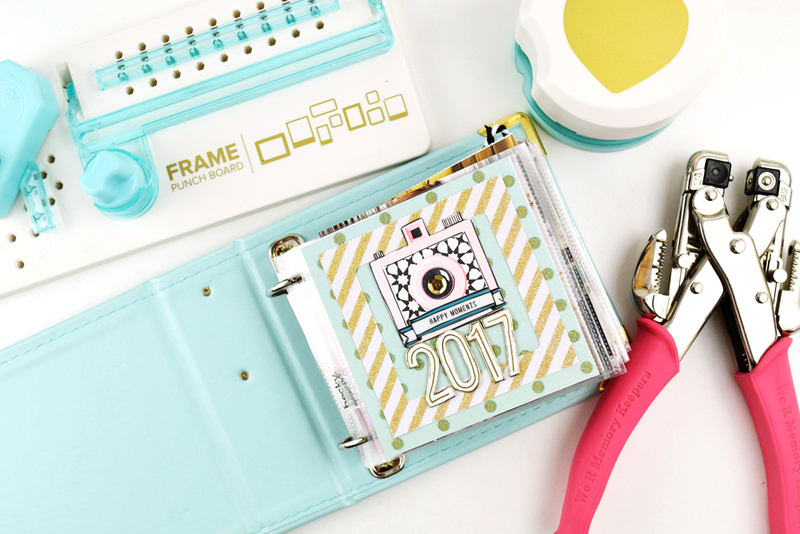 The Journal Studio line is perfect for planning but you can also use most of the tools for scrapbooking layouts, mini albums and more! For this layout I used my Magnetic Alpha Stencils to create the month names and my Book Binding Guide to create a frame for my layout. The Book Binding Guide comes with a Booklet with several Japanese bindings, I used one of those guides to punch holes on the border of my layout. Because the 12 x 12 sheet is longer than the tool I simply unscrew the top of the tool and slide the page to have full coverage. To create my month titles I used my Alpha Stencils. They are magnetic so you don’t have to worry about the guides moving! And there are Icons Stencils also! You should check them out! You can use any pencil you like, I used my son’s markers to make the titles. To create my journaling guides I used my Mini Magnetic Mat, I love this little tool and it is my go to tool when I need perfectly straight lines! I stitched my Japanese binding border with colored threads and I really like the texture it gives to my page. I completed my layout without using any supplies! Just a few tools, markers and thread. 2018 was great a year for my family and I am counting on 2019 being a better one! I am glad I can keep all our highlight moments in just one page. How was your year? Are you making a year in review layout?